Professor Krešimir Veselić singing with Magdalena Mlikotić and Meri Mlikotić. 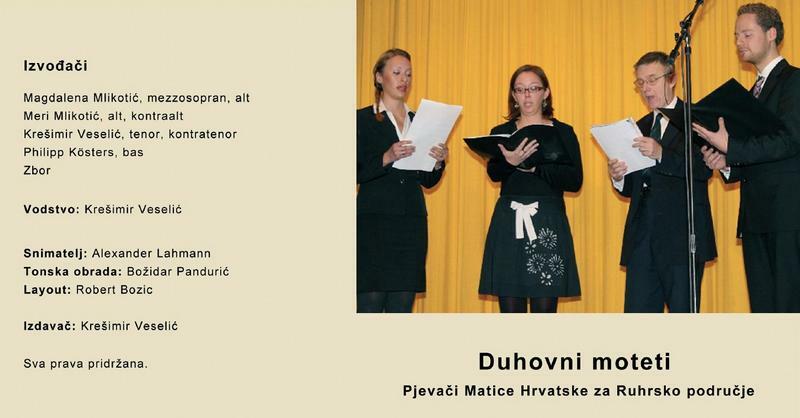 The Choir of Matrix Croatica for the region of Ruhr in Germany has been founded in 2006 by Professor Krešimir Veselić, distinguished Croatian mathematician. We can listen to the beautiful interpretation of "Ave regina caelorum" by Guillaume Dufay, a famous composer from the 15th century. This and other motets have been sung within the Catholic liturgy during the past two years. The choir is also called the Mixed Choir of Croatian Catholic Mission in Dortmund in Germany, since both institutions support its activity. Et pro nobis semper Christum exora. Alleluia.